PARIS -- The Latest- Prosecutor: Suspected police killer posted 12-minute video about the attack. A Frenchman once convicted for recruiting jihadi fighters recorded video of the attack in which two police officials died, authorities said Tuesday, as France's leadership reeled from what the president called a new terrorist attack. The Islamic State's Amaq news agency cited an unnamed source as saying an IS fighter carried out the late-night attack in the Paris suburb of Magnanville. While the extremist group has not officially claimed responsibility, French authorities view it in the context of the large-scale threat hanging over the country since IS attacks on Paris in November. Two police officials, a man and woman who lived together, were killed. The attacker, identified as 25-year-old Larossi Abbala, was also killed, while the couple's 3-year-old child survived. French President Francois Hollande held an emergency security meeting Tuesday about what he said was "incontestably a terrorist act." He said France was facing a terror threat "of a very large scale." France has been on particularly high alert as it hosts Europe's top sporting event, the monthlong European Championship soccer tournament, and is still under a state of emergency after the November attacks. Prime Minister Manuel Valls said, "It's a global threat, that is why we are fighting terrorism in Syria and Iraq, and on our soil." Abbala was from the western Paris suburb of Mantes-la-Jolie and was sentenced in 2013 to three years in prison, including six months suspended, for recruiting fighters for jihad in Pakistan, according to two police officials. The officials were not authorized to be publicly named discussing ongoing investigations. Two other security officials said Abbala recorded a video during the knife attack. One official said the assailant posted the video on Facebook Live, the social media site's live feed. A Facebook profile bearing the name Larossi Abballa - which vanished from the internet early Tuesday - showed a photo of smiling, bearded man. Two recent posts featured videos critical of Israel and Saudi Arabia. The last post publicly available was a mock-up of the European Championship logo highlighting the posters' purported masonic and occult symbols. One police official said at one point in the video, the assailant puzzled over what to do with the couple's child. 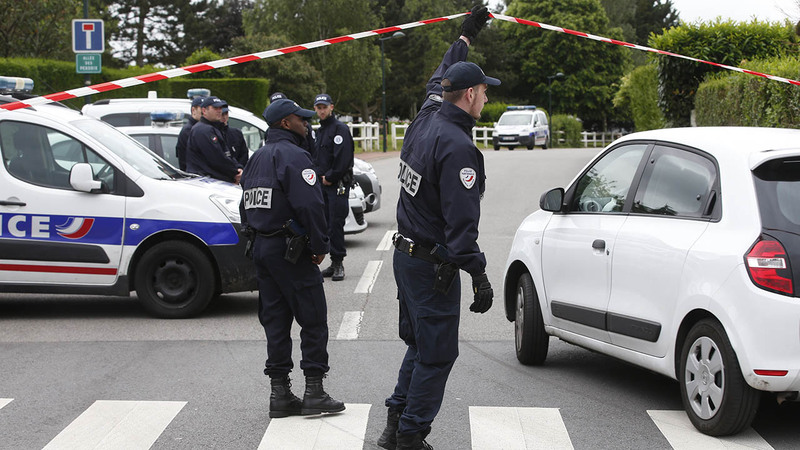 France, like other countries in Europe, has seen a series of stabbings aimed at police officers or soldiers and carried out by Muslim radicals. IS has encouraged its supporters to stage such attacks.